Everton produced a disappointing display in Roberto Martinez’ first match at Goodison Park but despite been outplayed and out passed for much of the match, Everton emerged victorious by two goals to one. Everton produced a lacklustre performance and seemed tired and off the pace as Real Betis won the majority of the 50-50s to leave the Toffees chasing shadows for much of the 90 minutes. Everton did however show plenty of spirit and quite literally produced a fighting performance to secure a two-one victory over their Spanish opponents. The Blues had much to thank Tim Howard for, with the American keeper producing an outstanding performance to keep Betis at bay. 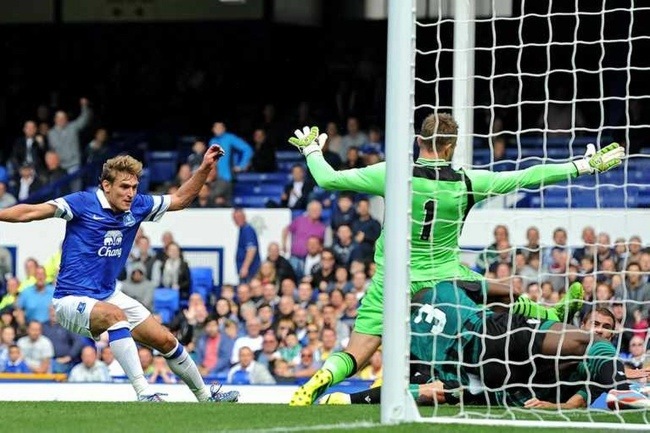 The positives were few and far between, but another goal for Nikica Jelavic was the bright spot of the afternoon. The Croatian has returned after his summer break determined to make an impression and produced a neat finish under pressure to score his fourth goal in four games. Jelavic looked full of confidence and worked hard for the team, producing a performance full of tireless running. His determination did boil over in the second half and he was fortunate to avoid a red card after aiming a punch/slap at a Real Betis defender. Kevin Mirallas looked lively and dangerous as he has throughout the pre-season. He took a while to get into the match, but when he did he created the opening goal for Jelavic and then got on the scoresheet himself after the Spanish keeper dropped a hopeful cross into his own net. Mirallas too, was lucky not to see red after he aimed a kick at a Betis defender following a tussle for the ball. Disappointingly, Darron Gibson left the action shortly before half time with a knee injury and he will be assessed at Finch Farm to see if he has a chance to travel to Norwich at the weekend. Marouane Fellaini didn’t take to the field at all, leading to gossip and rumours of a possible move to Manchester United. Martinez insisted after the match that the Belgium was protecting an injury and will be available for selection on Saturday. There is more to come from Everton and this was a disappointing performance, but it must be remembered that Everton only returned from Miami less than 48 hours ago. The players appeared short of motivation, but this will surely change when three Premier League points are at stake.